Getting some serious protests about climate change on the Boston College campus! Back in September the head of the White House Office of Science and Technology Policy, John P. Holdren, testified to the Congressional Committee on Science, Space, and Technology about the issue of climate change. He was affronted with my criticisms of the science behind climate change by the congressmen. As you can see in the video below (Daily Show coverage of the meeting begins at minute 2:45 in the video), this started out with Representative Steve Stockman (R. Texas) recounting his visit to NASA where he learned that global wobble is what caused ice ages. He also learned that this effect isn’t included in climate models, but that it is ignored because it is very slow and thus negligible. Apparently Rep. Stockman is having some memory problems, because he forgot the last part and tried to use this tidbit to suggest climate science is not well understood (see video for exchange). Below is a wonderful letter from the scientist at NASA who actually met with Rep. Stockman setting the record straight. Lets start getting ready for the election in 2016. Lets get anyone who denies climate change out! In the meantime, lets make waves in MA and get a real renewable economy off the ground. Belmont, MA – October 17, 2014, 9am – Four Cambridge residents were arrested this morning for trespassing within the Silver Maple Forest presently being clear-cut. Signs along Acorn Park Drive in Belmont with over 20 supporters read, “No climate change,” “Don’t cut our floodplain silver maple trees,” “Stop the cutting before it’s too late.” The arrests follow years of organizing to defend the Silver Maple Forest, an invaluable floodplain for Cambridge, Belmont, and Arlington. O’Neill Properties of Pennsylvania has been the major backer of the development, which would include 300 mainly luxury units and 60 affordable units. Belmont has not yet determined final permitting. Cambridge continues with Hearings and Policy Orders concerning the property as well. Organizers aim to draw attention to the commencement earlier this week of clear-cutting of eight acres of woodlands in Belmont and Cambridge. Earlier this week, five conscientious objectors trespassed to tie pink protection ribbons on many trees to call attention to tree felling in the Upper Alewife Basin’s only regional floodplain forest. Major cutting was seen this morning on the site and prompted the conscientious acts of civil disobedience. “People are acting out of their own conscience, and many have never before been arrested but consider this a serious environmental crime, especially in this era of climate change,” said Ellen Mass, an organizer who has been drawing attention to the forest for years. The arrests were peaceful and without incident. Dana Demetrio, Sylvia Gillman, Ben Beckwith, and Paula Sharaga were escorted by police out of the forest after refusing to leave when asked to do so. They say permits are “up in the air” in Belmont and it is nonsensical to clear-cut before building permits are approved. A City of Cambridge Climate Vulnerability study has been delayed four times. The study would demonstrate the invaluable services provided by the 15-acre floodplain forest, which has stood for 60 years. At 7:00 AM this Monday, October 20th, a wide range of groups, organizations, and individuals will hold another rally at the clear-cutting staging ground down the road from 15 Acorn Park Dr. More individuals will be called to take an act of civil disobedience. That same day, the Cambridge City Council will hear a Policy Order that no Cambridge property may be used for the development, which is problematic for the developer whose design plans include land in Cambridge. An injunction has been filed to stop the tree felling in Court. Trees are falling, but people of conscience are making sure they are heard. Two weeks ago about a dozen BC students attended a march in NYC that filled a 2.2 mile route with about a half million people. This Thursday a panel of these students will discuss their experiences at the march, and where the movement to stop rapid climate change will go next. Come join our discussion and have some milk and cookies too! 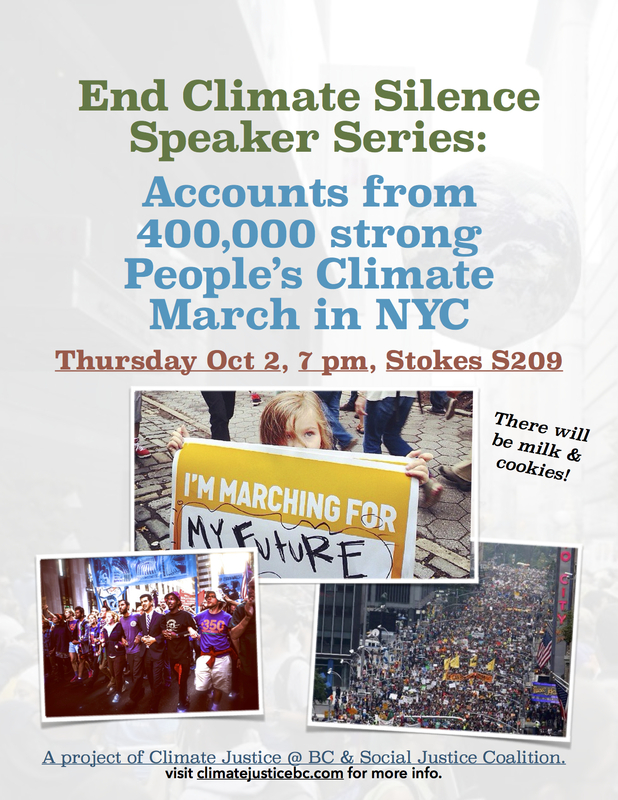 (Stokes S209, Thursday 10/2, 7pm). Read Nikki’s account of why students may want to question whether they are truly part of BC, or if the administration & the board of trustees reserves that title for themselves by refusing to register student organizations.